Christmas is pierogi. My mother made hundreds every year. As a child I watched her standing at the counter, flour spilling onto the floor. In my teenage years I helped, mostly milling around, making a fuss, and waiting for the taste-test. We brought dozens of them, wrapped in foil, to Ray & Elaine’s on Christmas Eve, ready to reheat. We ate more in the morning, and then packed the rest for Marcia & Nelson’s later that day. With any luck there would be some leftover, or stashed away in the downstairs fridge, or hiding behind the ham. My grandmother made them too. I can still see her handwriting on the recipe card. She dotted her i’s with circles and she was vague about quantities. I’m not my grandmother and I’m not my mother but I’m doing my best. Potatoes are cheap and traditionally used in Polish pierogi. And it’s Christmas in less than a week, so I made some. I brought them to Scott & Margeaux’s, wrapped in foil, ready to reheat. Because it’s Christmas. And that’s what we do when it’s Christmas. Want my recipe? It’s vague on quantities in places, and in detail, like family traditions are meant to be. Start with the mash. Rough chop potatoes, smash garlic, and chuck them all into already boiling, salted water. I leave the skins on for texture purposes. 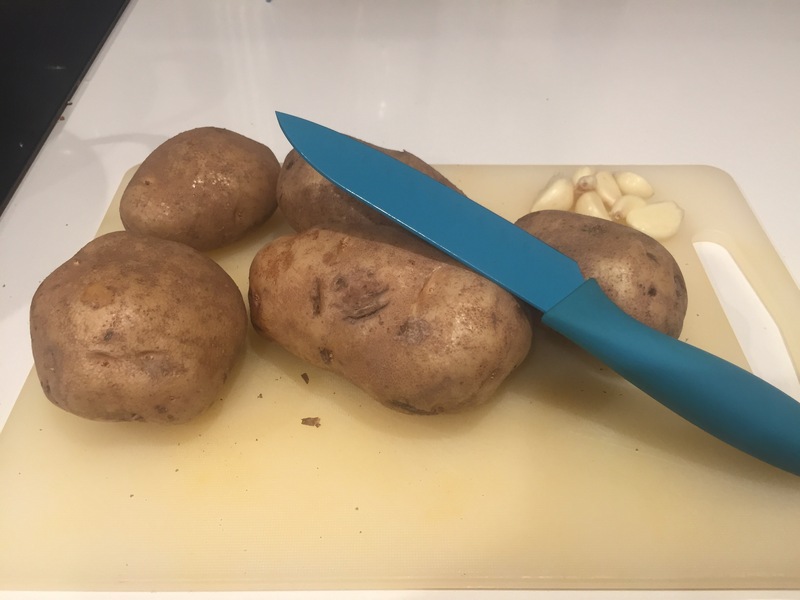 I wait about half an hour, or use a fork to test the softness of the potatoes. It should slide in. 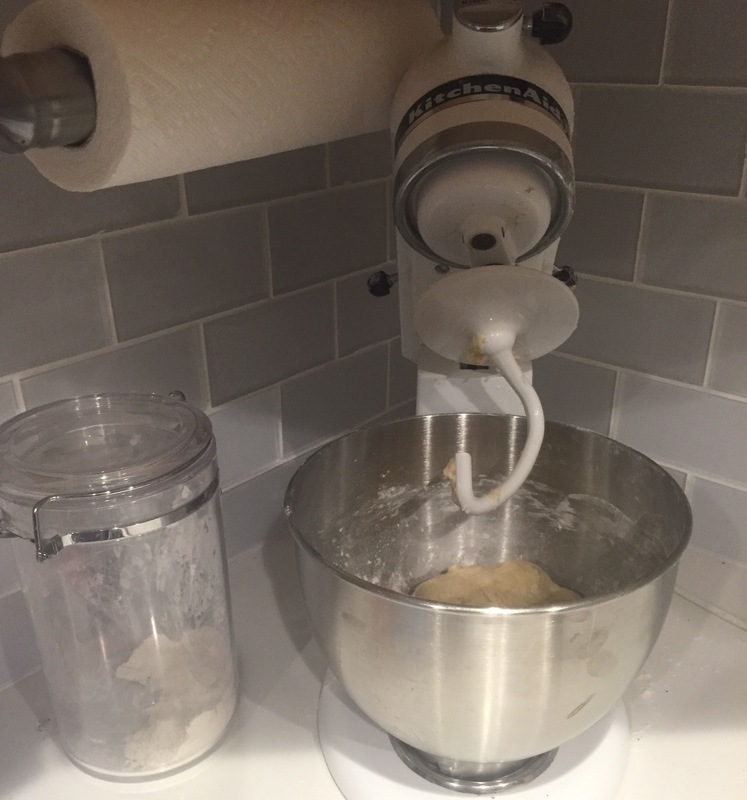 Meanwhile I use my mixer for the dough. 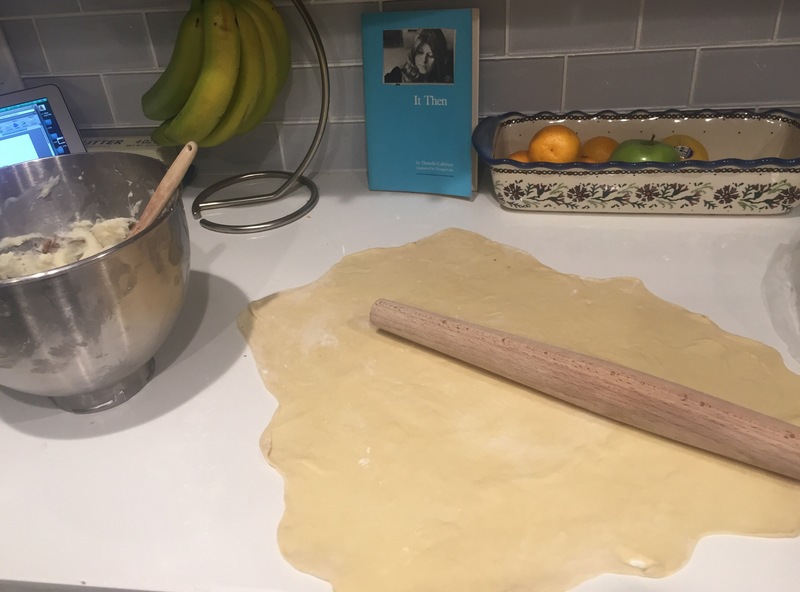 I weigh out 15.75 oz white flour, 3 eggs, 2 tbsp sour cream, and about a half a cup of water (give or take – dough should not be sticky.) Let the dough rest for 20 minutes. I make the mashed potato in the mixer too. To the potatoes and garlic I add butter, bacon (set aside the pan with the grease, you’ll be using that later), fat free half and half, milk, and sour cream. I don’t measure any of it. It’s all eyeballing and taste – make your mash how you like it. I let it mix while I made a cup of tea. 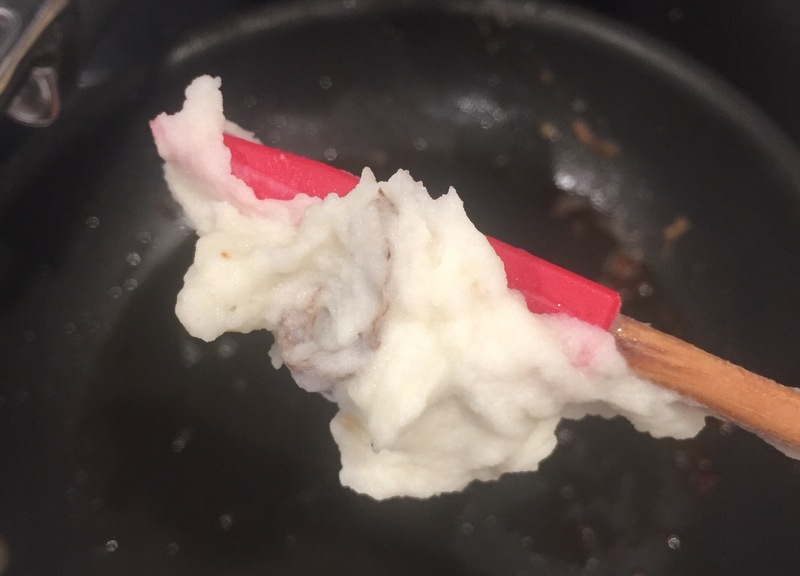 There were still chunks – that’s fine. That’s good. I like them like that. 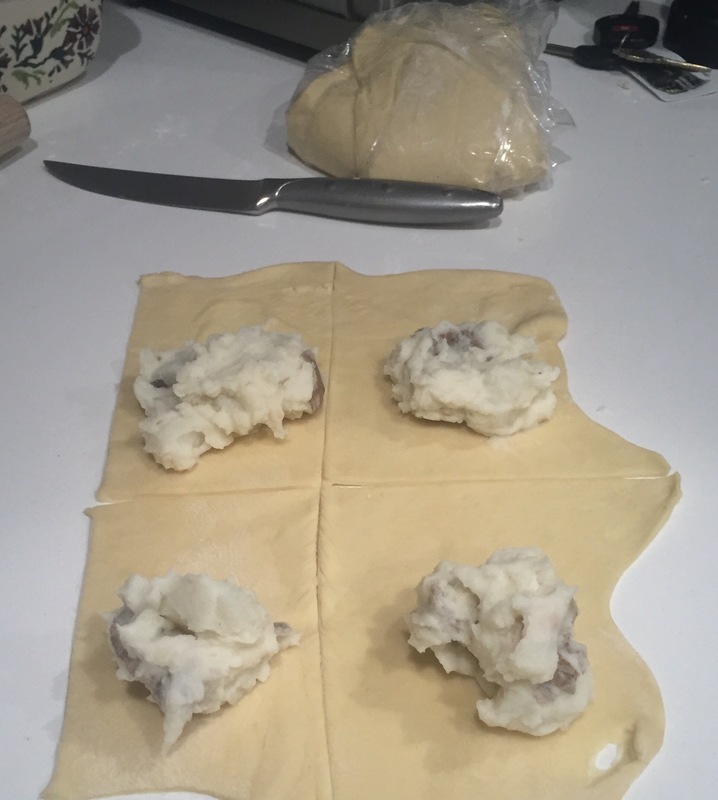 Typically I don’t use a rolling pin with dough, (I like to flatten it with my fingers) but for pierogies you have too because if the dough is too thick it’s no good. Roll it out thin enough that it doesn’t break, but teeter on that edge. My pierogies are never uniform. The basic trick is to use a spoon (like a tablespoon) to scoop the filling onto the dough. I cut the dough squares large enough so I can fold over and tuck the edges. This is what a done one looks like. It’s been boiled, and then fried in the bacon grease left over from the mashed potato. It’s beautiful, right? 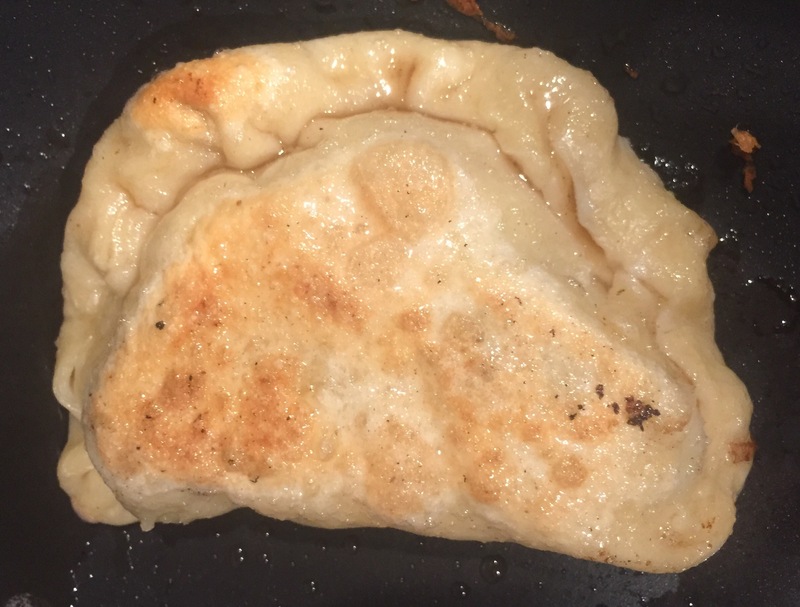 It’s not my grandmother’s pierogi, but I’m pretty sure I’m doing it right anyway.